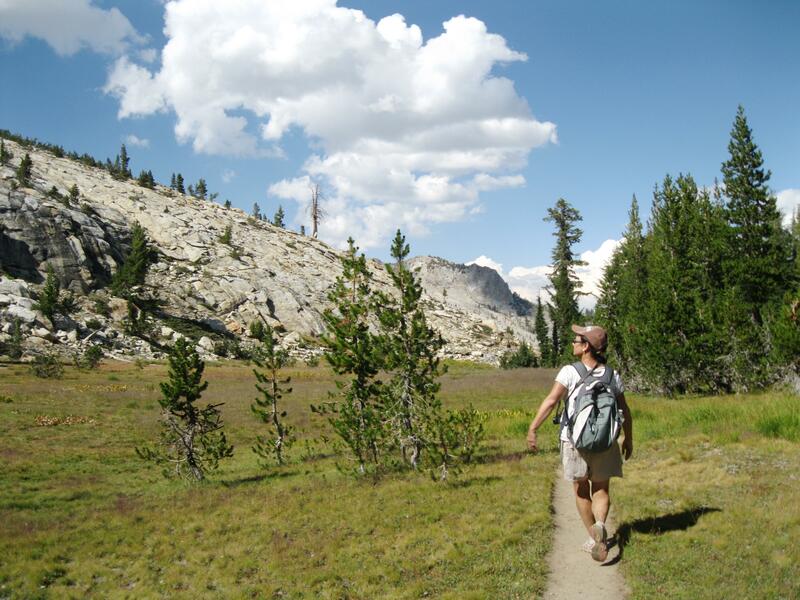 John Muir, describing how best to spend one’s day in Yosemite, once said, “Go straight to Mt. 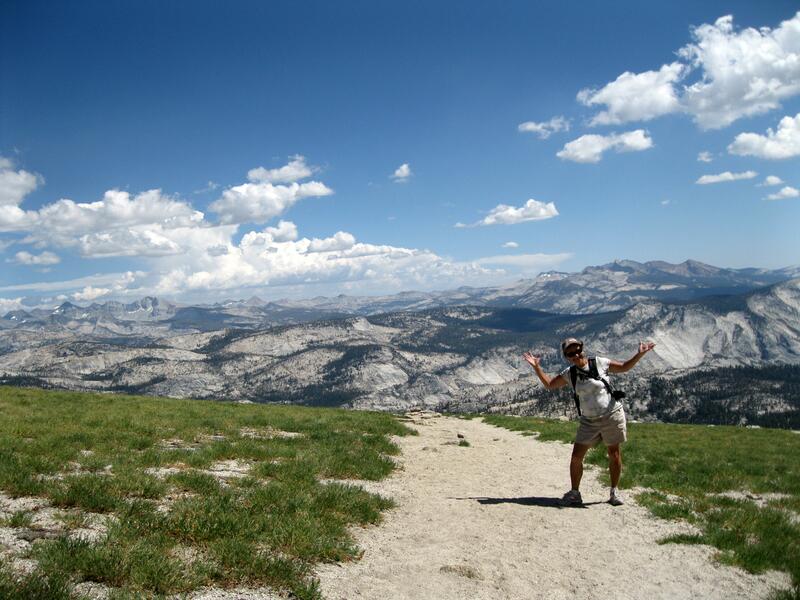 Hoffman…from the summit nearly all the Yosemite park is displayed like a map.” Mt. 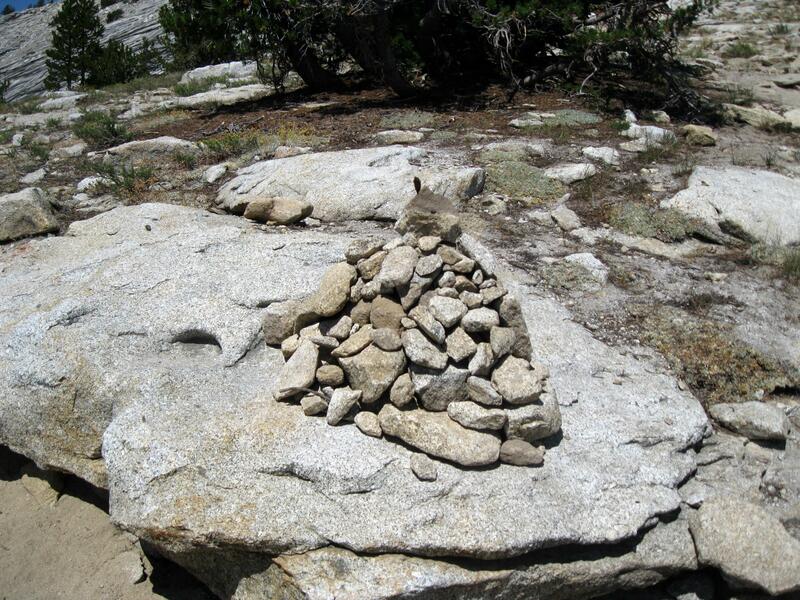 Hoffman is the geological center of Yosemite National Park marked with a survey marker. Today Mary Elizabeth and I ventured to the top. 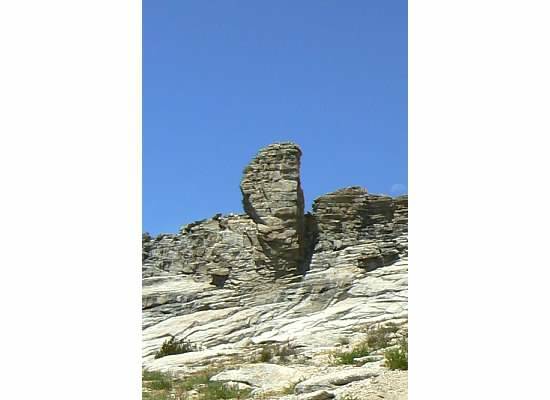 Hoffman’s Thumb at Mt. Hoffman. The first stop on our trek to the top of the mountain was May Lake. 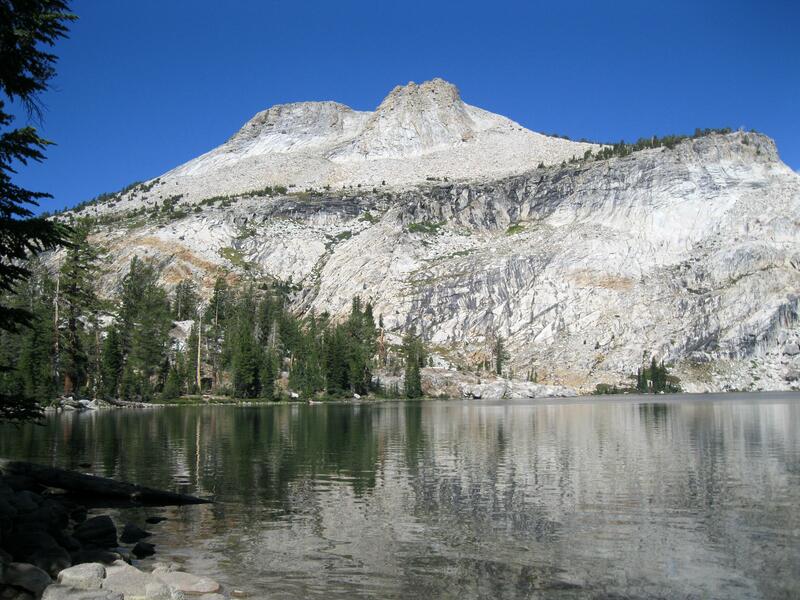 The lake is host to a High Sierra Camp and sits at the base of Mt. Hoffman (whose summit was blocked from our view for most of the hike). Wildflowers grew along the trail. We watched as a swarm of orange butterflies flew from flower to flower drinking the sweet nectar. We stopped occasionally to look back at the ever-changing view. May Lake peeking through the trees. 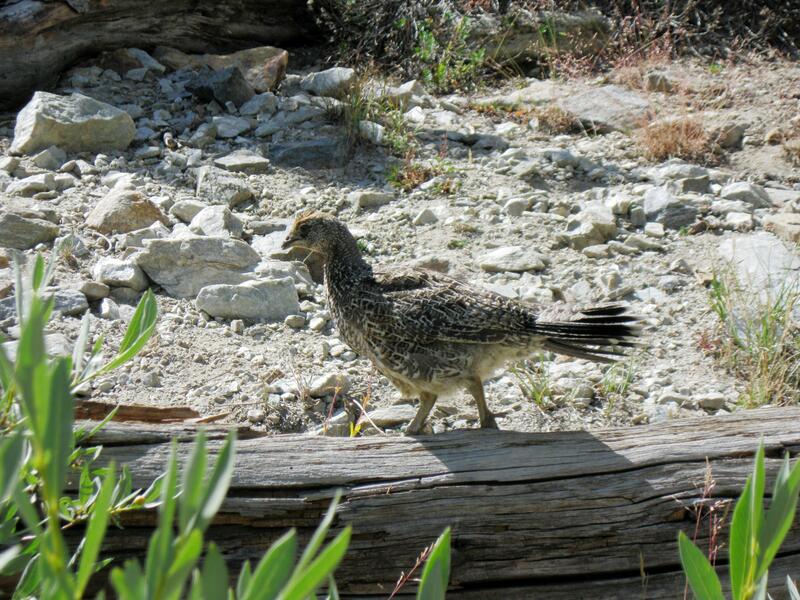 Walking through a particularly lush area, we saw several grouse who seemed apathetic to our presence in their home. Marmots and alpine chipmunks ran about freely. Looking back again, we saw the sparkling blue of May Lake. Looking down at May Lake from the trail. 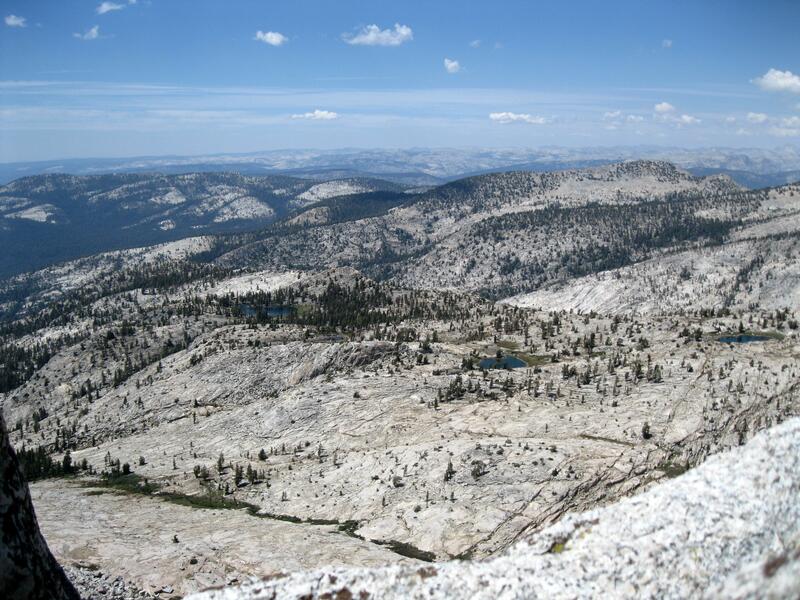 A sunny meadow sat flanked by the forest and the adjacent granite base of Mt. Hoffman. Leaving the meadow, the trail wavered up and down through a shady forest, the last shelter from the sun before the climb. As we emerged from the woods, our workout began. Ready to begin the rigorous climb. Cairns led the way over the decomposed granite. 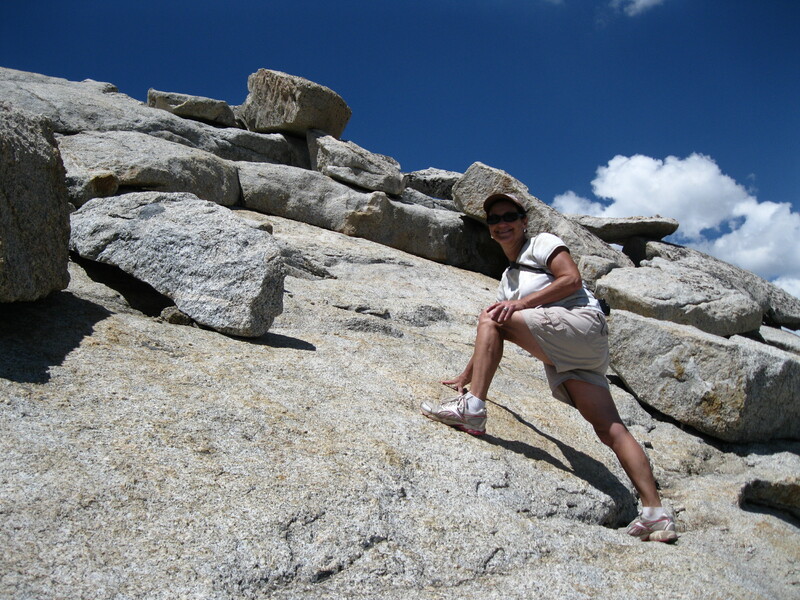 With so many rocks and boulders in our midst, it was often tricky to find a trail marker. 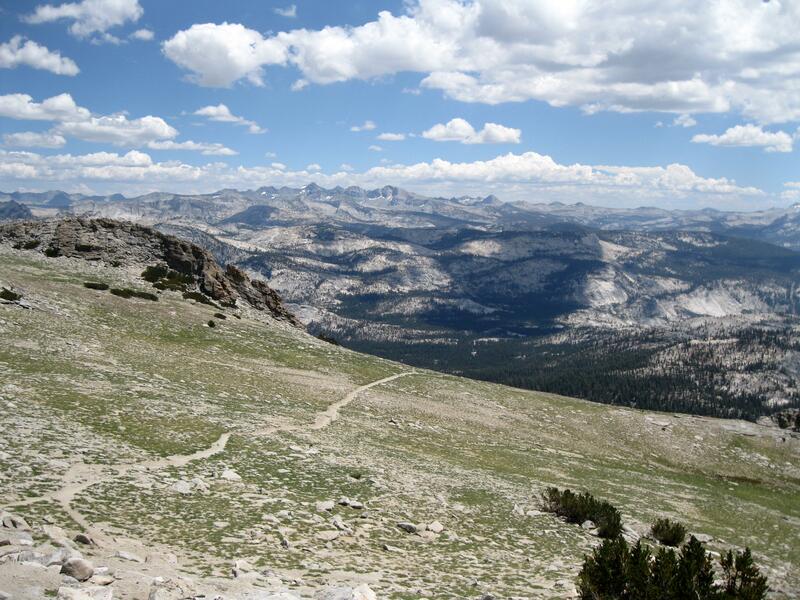 The panoramic view was breathtaking as we climbed up 2,000 heart pounding feet. At this point the true summit of Mt. Hoffman was visible. Climbing higher. 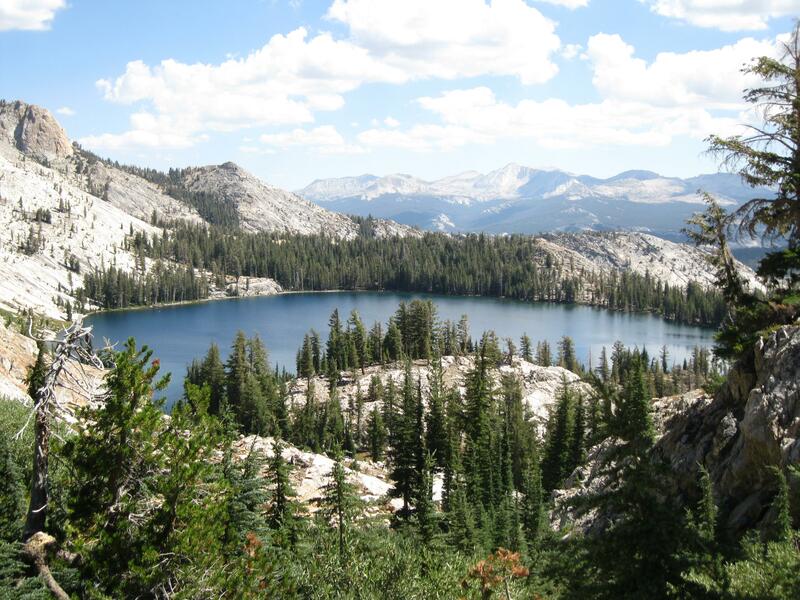 The blue of Tenaya Lake is visible on the right. We continued the trudge up hill and veered left to begin climbing the rocks. Unable to find a spot of shade to sit for lunch, we perched in the sun like marmots and rested our weary muscles. Four falcons glided through the air and swooped down to the ground in search of food. A hungry marmot moved lazily over the rocks. After lunch, we left our packs and pulled ourselves up the sloping mass of rocks. I thought we were doing pretty well for a couple of middle-aged women. Mary Elizabeth looking up at Janet climbing the rocks. 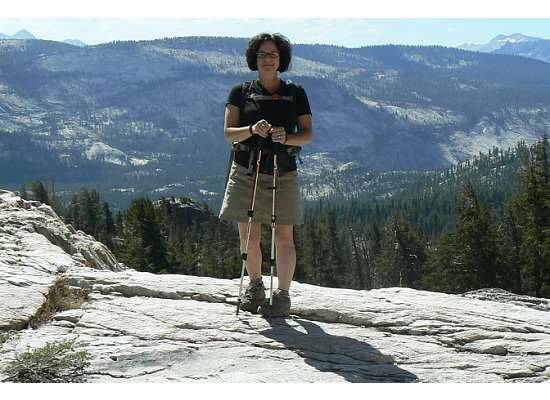 Near the top, I peeked over the edge and saw an expansive view of Yosemite. 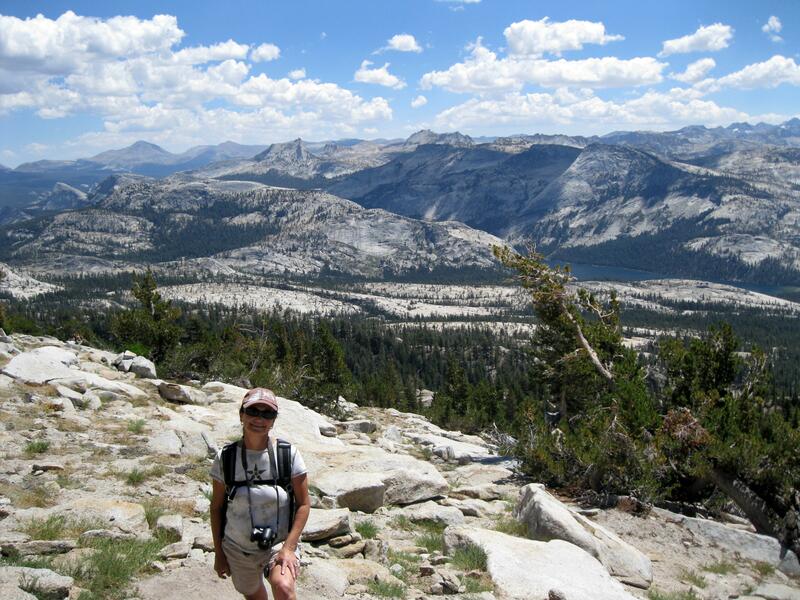 Several unnamed lakes sat below nestled like jewels in a sea of gray granite. The wind came in gusts making us feel like we were going to be blown off the mountainside. Peeking over the edge at the other side of the mountain. We made our way off the rocks and back to May Lake. We were pleased with ourselves for having accomplished what we did. We slowly and surely climbed the mountain and found its music and poetry along the way. 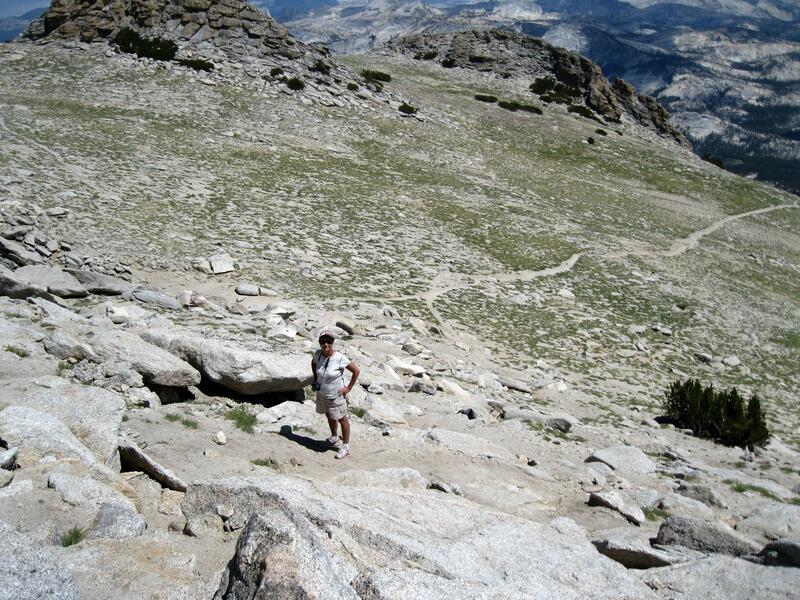 This entry was posted in Yosemite Hikes and tagged Hiking, May Lake, Mt. 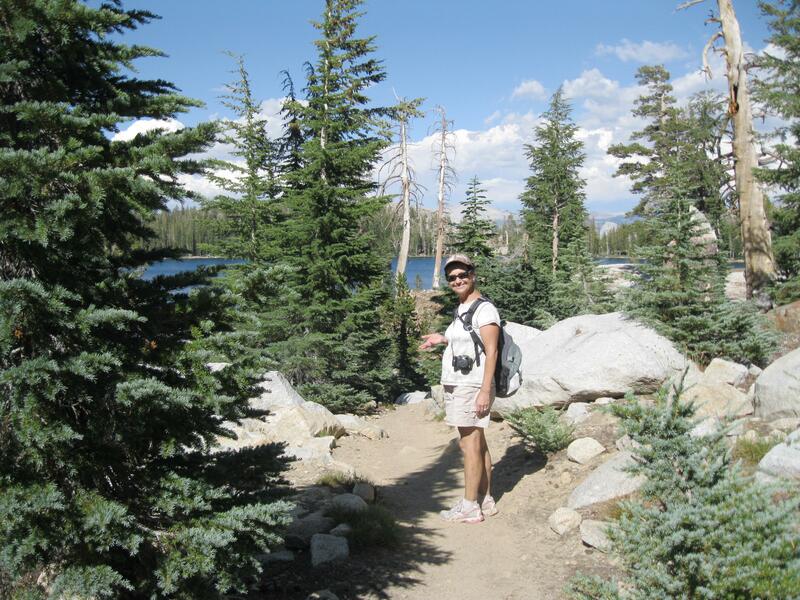 Hoffman, Yosemite on August 11, 2012 by Janet. I LIKE the new look of your Blog! Adding the hyperlinks was a great addition. Thank you. 🙂 I like that you commented here too. My son climbed it this summer after we got to May lake. Better views. Thanks for your pictures and thoughts.